Archadeck of Columbus is part of the Outdoor Living Brands family of outdoor companies. Nothing invigorates the mind and body like spending time in a beautiful outdoor setting. Visit any travel site or flip through a vacation magazine and you will see photo after photo of scenic vistas, bright colors and friendly people. What we sometimes forget is that we can give ourselves the gift of relaxation and inspiration by looking just outside our own back doors. It’s also a great idea to have a few well worn magazines and websites for regular tidbits of fresh advice and fun commentary. To this end, you will love this new online magazine published by our parent company – Outdoor Living Brands. Outdoor Living Brands has launched a new outdoor living online magazine to inspire you with new ideas, educate you about new products and trends and give you a road map to help realize your dreams right in your own backyard. The name of the magazine really says it all: Loving Outdoor Living. The magazine is available to view for free online or to download as a full-color PDF file. Once you’ve provided a couple quick tidbits of information, enjoy reading engaging articles on all aspects of outdoor living and entertaining, including features such as new methods for keeping bugs at bay or how to shop for a local contractor. Gorgeous photos, tasty recipes and handy resource guides supplement the core content and enliven each issue. 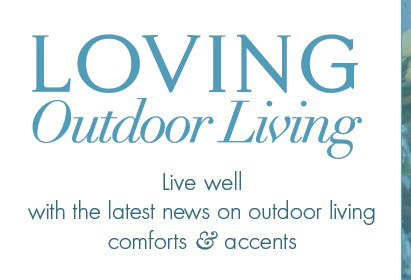 If the magazine delights you, but leaves you wanting more, you can visit the Loving Outdoor Living blog. Check in often to see new posts highlighting products, services, vendors or events that will provide even more exciting inspirations for your personal oasis. Editor Larry Spada includes links to order items from featured vendors online and sometimes helps readers to score a discount coupon. See the newest releases from familiar companies like Crate & Barrel and less well-known retailers like Fab or TUUCI ®. You never know what you will find when you stop by the blog. You can also follow Larry on Google+. Larry has a gift for for keeping his posts brief, even while entertaining and engaging his audience. You never know where and when inspiration will strike, but if you check out Loving Outdoor Living, the odds are great that you will find it there. If you’re ready to turn your own Columbus-area backyard into your own personal outdoor living paradise, then look no further than Archadeck of Columbus. For more than a dozen years we’ve built outdoor spaces for homeowners throughout the entire Columbus area. On trend here in Columbus are combination spaces. Many of our clients are choosing to pair a porch with a patio or a patio with a deck. This allows you to have two unique spaces to enjoy your backyard. Often one space is for dining and another is for seating. Perhaps one offers shade and the other allows you to soak in the sun. Many of our customers ask us to build these spaces at different levels such as a step down patio. This gives even more dimension to your already custom space designed and built for the way you want to live. Contact Archadeck of Columbus today to see how we can make creating your dream backyard an enjoyable experience, start to finish. The consultation is completely free. Call (740) 879 -3730 or email us at westcolumbus@archadeck.net. We look forward to your call. Next Next post: Design your new porch around time with friends and family?